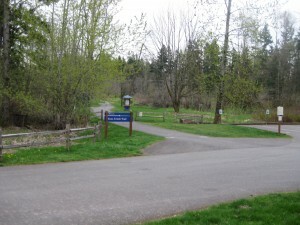 Today after work I went off to explore the Big Soos Creek Trail. I was prompted to do this because of King County Park’s Big Backyard Fitness Challenge, which is part of the Healthy Incentives program for the health insurance I get from the County. Basically, if I complete this challenge, then I get to have lower deductibles and other out-of-pocket costs. There is a secret code written at about 30 different sites in various parks scattered throughout King County, some rated “low intensity” and some “high intensity,” and I just have to visit 10 of then by June 30. The Parks Fitness Challenge is one of several choices of activities to do to qualify for the so-called “Gold” expense level. This activity is new this year and I’m actually excited about it because it gives me an excuse to visit new places and is actually a fun challenge rather than just bureaucratic overhead, which the other activities are like given my already active lifestyle. However, even the “high-intensity” challenges are still fairly tame by my standards, so I’m adding a twist, I am trying to do as many of these as possible without driving. 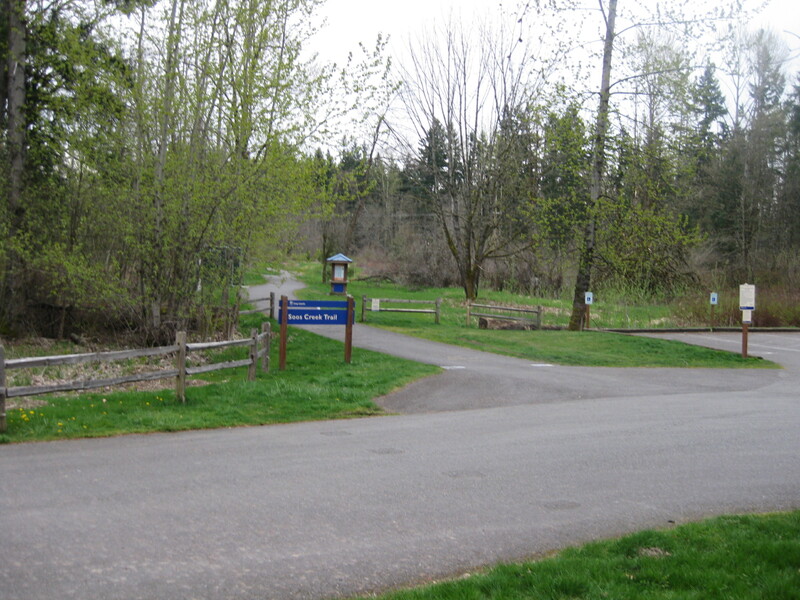 There is a bus, the Route 158, that stops mere steps from my office and will take me directly to the south trailhead of the Big Soos Creek trail in East Hill Kent. The only problem is that this is a weekday-only commuter route, hence the reason I did this after work on a rare nice day in early April. I put my bike on the 158 at 5:38pm and took a seat next to all of the commuters, after a mini tour of Kent I was at the trailhead by 6:30. As the bus drove away, I realized that my helmet with head light and blinky red light were still on the bus tucked away under my former seat; grrrrr! At least the Metro Lost & Found is just downstairs in my office building so I can retrieve it tomorrow. I headed down the trail helmet-less. The trail was a fun little roller coaster of a paved path with rolling hills, tight turns, and narrow causeways, winding through a wetland area and powerline right of way. There were lots of bugs, annoyingly hitting my helmet-less forehead as I sped down the path. I chewed through all 6 miles of trail in about 30 minutes, and got my secret code at the end. 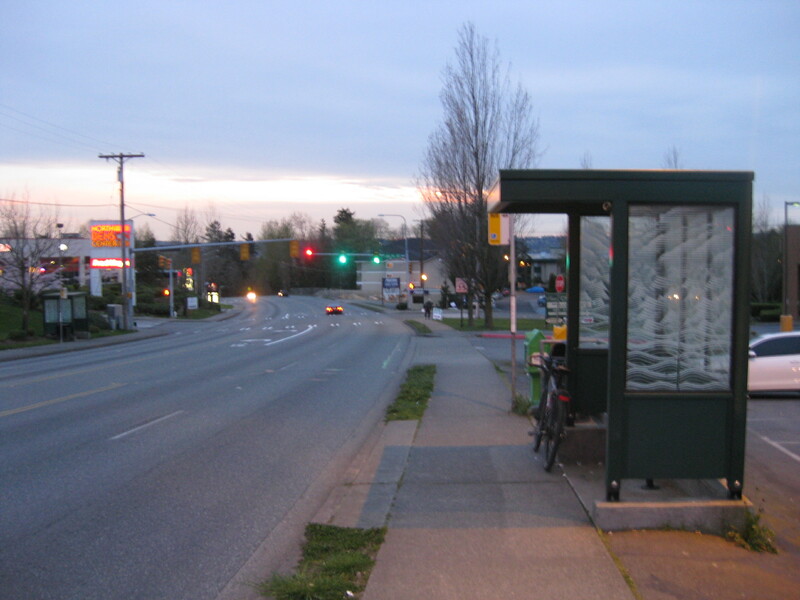 My original plan was to continue riding all the way (downhill) to Renton and then to the Rainier Beach Light Rail station, but it didn’t seem safe riding on these suburban roads with my lack of helmet and lighting since it was about to get dark. Instead I rode another mile to a Route 169 stop, which I took to Renton where I got a Route 106 to Rainier Beach and then just two stops on the Light Rail and I was home by 9:15pm. That probably took an extra 45 minutes versus if I could have rode directly to Rainier Beach. A yummy dinner was waiting for me when I got home! Now I have 4 out of 10 locations, just 6 to go. Should be easier now that the weather is getting better and more daylight is becoming available. Today I am leaving for Austin, TX for this year’s installment of Honk! TX. Last year I had a blast down there and I’m looking forward to another weekend of performing in the Lone Star State. I am also looking forward to the 85 degree weather. That’s all for now. I’m currently waiting for my flight to depart and a have a laptop with a copy of an entire service change worth of data from Metro’s Automated Passenger Counter data (about 1.2 gigs of data). My tedious in-flight mission is to use this data to predict increased dwell time at all downtown bus stops after the ride free area goes away and everyone will have to board through the front door and pay a fare. Tomorrow, from 4-6PM, there will be a Pay-on-Entry simulation in the Downtown Seattle Transit Tunnel (DSTT). Basically, we’re going to force/ask everyone to board buses through the front door only, as if they had to all pay a fare upon boarding and there were no Ride Free Area. I had to organize a team of “volunteers” to help herd customers through the front door and do various data collection tasks. Should be interesting. Come down and check it out! 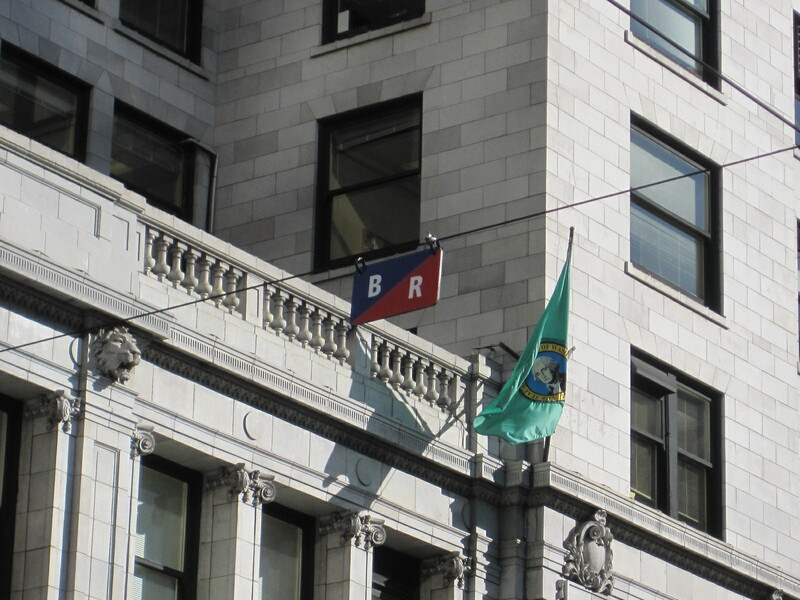 Back in early February, there were some significant changes to bus routes in Downtown Seattle. Some of these changes were a result of bus stop capacity analysis I worked on in late 2010. I haven’t done much writing on my blog lately about work-related stuff (it’s generally the last thing I want to spend time on when I get home in the evening), but I thought that this would be a good chance to highlight some things that I worked on that you can see out on the street. 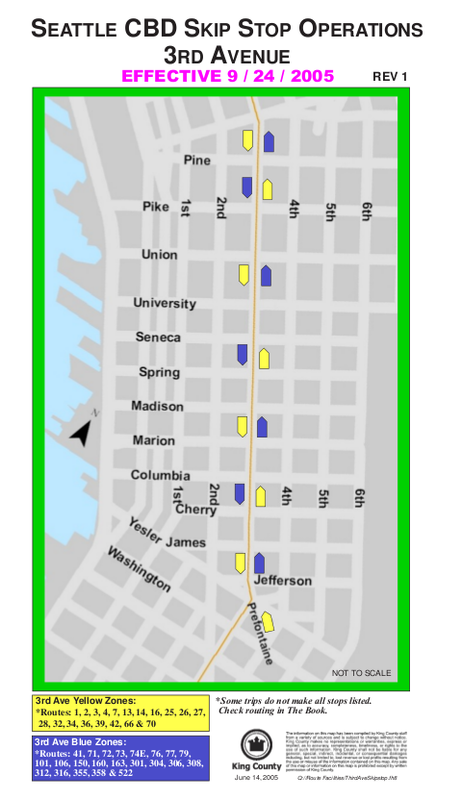 The big change was that most of the bus routes that used to travel on 1st Ave are now on 3rd Ave. This was done because 1st Ave is beginning to become impacted by construction related to the Alaskan Way Viaduct replacement; it was decided that 1st Ave buses needed to be moved to help maintain reliability and eliminate the need to do ad-hoc reroutes at times when 1st Ave would be closed completely. The other reason for moving buses to 3rd Ave is to prepare for the Rapid Ride lines that will begin running through downtown in year 2012. 3rd Ave uses skip-stop operation, where buses stop at every-other bus stop. 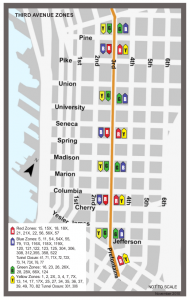 Before February 2011, buses on 3rd Ave stopped at either the “Blue” zones or the “Yellow” zones. The Blue and Yellow Zones were offset so that the dropoff zone for a particular route was not on the same block as the pickup zones, see Figure A. A previous decision had been made that the Rapid Ride zones would have pickup and dropoff on the same block. Sounds good for ease-of-use from the customer’s perspective, but this presented a problem. This meant that the Rapid Ride zones were at the Blue zones southbound and the Yellow zones northbound. A further constraint was that there were a host of other routes that would need to share bus stops with Rapid Ride. The two RapidRide lines that will go through downtown in 2012 are the C-line, which will replace the current route 54 serving West Seattle, and the D-Line, which will replace the route 15 serving Ballard. The route 18, for example, serves a similar area as the 15 so it would need to share the same bus stops as the 15, or future Rapid Ride D-Line. Another major constraint was that we didn’t want to make the people who would have to switch bus stops now, have to switch again in 2012. So the route 15 and 54 had to be put at the future Rapid Ride bus stops, otherwise we would be making these riders move again in 2012. An extra challenge with this constraint was that the full set of changes planned for 2012 were just rough plans and not certain at this point. 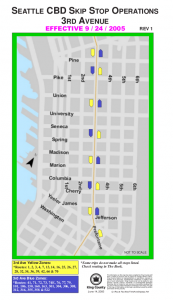 My task was to determine which skip-stop groups to assign the 1st Ave routes to, and what adjustments would be needed to the existing routes on 3rd Ave. I went to work first calculating the available bus stop capacity, per the methodology outlined in the “Transit Capacity and Quality of Service Manual” (for more information on that subject, you can view a powerpoint I presented at an American Public Transit Association conference back in 2007). That was the easy part, the hard part was then determining the necessary changes that would need to happen to ensure that the volume of buses would not exceed the available capacity and cause backups. I soon realized that there was no way to accomplish this with the Rapid Ride constraints and the existing blue/yellow skip stop pattern. The blue zones would run way over capacity with the added routes, but if we shifted routes to Yellow, then that would screw up the northbound direction. To avoid potential bus driver confusion and for simplicity’s sake, we wanted to avoid having specific routes run one color one direction and another color the other direction. The solution was to establish another set of color patterns, layered on top of the existing Blue/Yellow. Red was the logical choice for the future Rapid Ride zones, but red was already taken by the Red/White skip-stop patterns on 2nd and 4th Avenues. 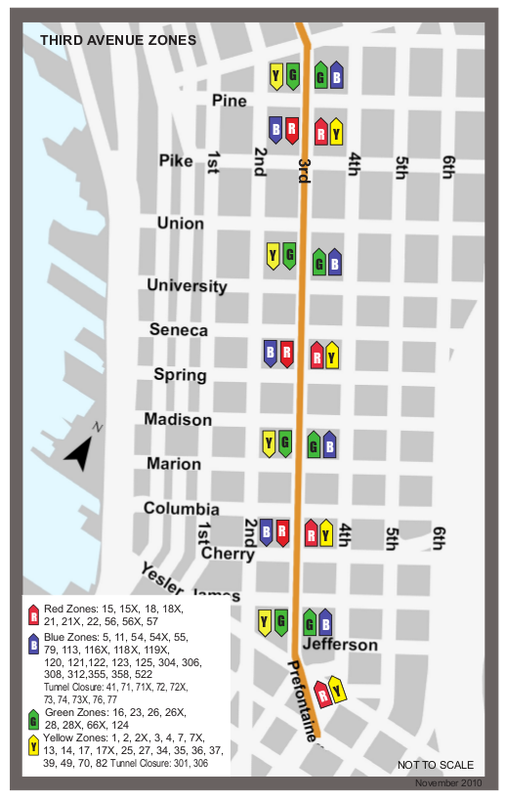 After much debate, it was decided that the Red zones on 2nd and 4th would change to Orange. There needed to be another pattern for the other routes that had to move to make room for the new “Red” routes, this became the “Green” stop pattern, hence the Red/Green pattern was born. The Red/Green pattern has stops in both directions on the same block, as shown in Figure B. The new 4-color scheme gave us maximum flexibility to allocate bus routes to fill the available capacity, but 3rd Ave was still overloaded. We identified another set of other routes, mainly suburban peak-only routes, that would be moved to 2nd and 4th Avenues. Moving the 1st Avenue buses onto 3rd Avenue has other fringe benefits. One is that all West Seattle routes are now consolidated onto 3rd Avenue, and we were able to keep all West Seattle routes at the Red zones; no more running between 1st and 3rd trying to catch the next bus to the West Seattle Junction. Another benefit is that mid-day bus volumes on 3rd Ave are significantly increased, so someday SDOT might be willing to make 3rd Ave an all-day bus-only street. Although the new 4-color scheme might seem confusing, the beauty of the system is that every route is assigned one single skip-stop color. As far as I know, we are the only transit system in the world that operates a dual-layer skip stop pattern like this. There was still concern that bus drivers might get confused, so it was decided that we would install some additional signage ahead of each bus stop to help drivers know the colors of the next bus zone. I had the idea of attaching signs onto the trolley overhead wires; we already had those “power off” signs, so why not install a similar type of sign for the color group markers? The trolley lines were already King County property, so we wouldn’t have to deal with permits or lengthy SDOT reviews or any of that stuff. I somehow got the task of coordinating this work with the trolley line crews and deciding where to put these markers. After much discussion about the design and placement of the markers, including testing some prototype markers in the field for a couple months, the design shown in Figure C was decided upon. I marked up a sketch for where each marker should go and oversaw the actual installation by the trolley line crews on a rainy day just before the service change. On February 5th, these changes went into effect. I was out street teaming on Monday helping customers figure out the new changes. A guy approached me and said that he had been waiting for a 66 bus and two had already blown past him. I kindly informed him that the 66 now stops two blocks north or south of this bus stop (Green stops, to be precise). He responded with “what idiot came up with that idea?” I said sorry and handed him a free ride ticket.